To improve population diet environmental strategies have been hailed the panacea because they require little agency or investment of personal resources; this contrasts with conventional strategies that rely on individuals to engage high levels of agency and make deliberate choices. There is an immediate need to improve understanding of the synergy between the psychological and environmental determinants of diet in order to optimise allocation of precious public health resources. This study examined the synergistic and relative association between a number of food environment and psychological factors and the dietary behaviours of a population sample of women with young children. Women in Hampshire were recruited from children’s centres and asked about their demographic characteristics, psychological resources, dietary behaviours (food frequency questionnaire) and perceptions of healthy food access and affordability. Three local food environment factors were objectively assessed: i) spatial access to food outlets using activity spaces; ii) healthfulness of the supermarket where women did their main food shop, (based on nine in-store factors including price, placement and promotion on seven healthy and five less healthy foods); iii) nutrition environment of children’s centres visited frequently by the women, assessed via staff-administered questionnaire. 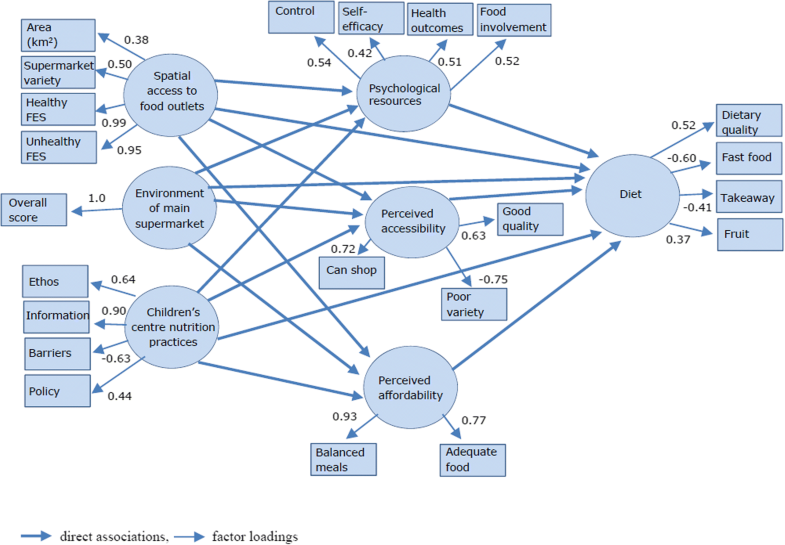 A theoretical model linking environmental factors to dietary behaviours, both directly and indirectly through three factors representing individual agency (psychological resources, perceived food affordability, perceived food accessibility), was tested using Structural Equation Modelling. Complete data were available for 753 women. The environment of women’s main supermarket was indirectly related to their dietary behaviours through psychological resources and perceived food affordability. Shopping at supermarkets classified as having a healthier in-store environment was associated with having greater psychological resources associated with healthy eating (standardised regression weight β = 0.14SD, p = 0.03) and fewer food affordability concerns (β = − 0.14SD, p = 0.01), which in turn related to healthier dietary behaviours (β = 0.55SD, < 0.001 and β = − 0.15, p = 0.01 respectively). The three food environment factors were not directly associated with dietary behaviour (p > 0.3). The overall model fit was good (CFI = 0.91, RMSEA = 0.05 [0.05, 0.06]). This pathway analysis identified three focal points for intervention and suggests that high-agency interventions targeting individual psychological resources when combined with low-agency supermarket environment interventions may confer greater benefits on dietary behaviours than either intervention alone. The limited effectiveness of educational and information campaigns at tackling stubborn public health problems like obesity and poor diet is now widely recognised [1, 2]. It has been proposed that these types of interventions are limited by their requirement for high levels of individual agency, or purposeful enactment of available psychological, cognitive, social and financial resources, to be effective [3, 4]. Alternative low-agency public health interventions, which require little investment of an individual’s resources and involve addressing the broader environmental determinants of health behaviours such as fiscal measures, school food policies or product reformulation, are considered to hold great potential for being effective and wide-reaching [3, 5]. Evidence from two systematic reviews supports the notion that high-agency obesity-prevention interventions, like nutrition information campaigns, produce relatively small effects, particularly among those with the poorest dietary behaviours [6, 7]. However, there is contradictory evidence from another review which found little difference in the influence of obesity-related policies on health inequalities according to their required level of agency . These findings suggest that calls to shift policy and research activity towards either low- or high-agency initiatives to improve health behaviours, like diet, may be oversimplifying the complexity of human behaviour [9, 10]. Contemporary theoretical frameworks, like the socioecological model, emphasise that health behaviours are the product of synergistic action between individual, social, environmental, policy and economic factors . A number of conceptual models also postulate specific pathways of influence, indicating that environmental factors can act directly on diet, and/or indirectly through psychological mediators such as perceived control [12–14]. However, with most research having focused on the direct relationships, few studies have tested potential mediators of the pathway between food environment exposures and diet [15, 16]. There is a clear need for empirical evidence to understand the relative effect of, and synergistic action between, the various psychological and environmental determinants of diet to inform appropriate allocation of precious public health resources . This study applied the widely used conceptual framework, the model of community nutrition environments , to test the relative importance of a number of environmental and psychological factors in their association with dietary behaviours among a population sample of women with young children, with good representation of those from disadvantaged backgrounds. All model components were identified from existing evidence of dietary determinants among this population [15, 17–19]. The model (Fig. 1) posits that dietary behaviours are directly affected by three individual-level psychological factors: i) psychological resources (e.g. 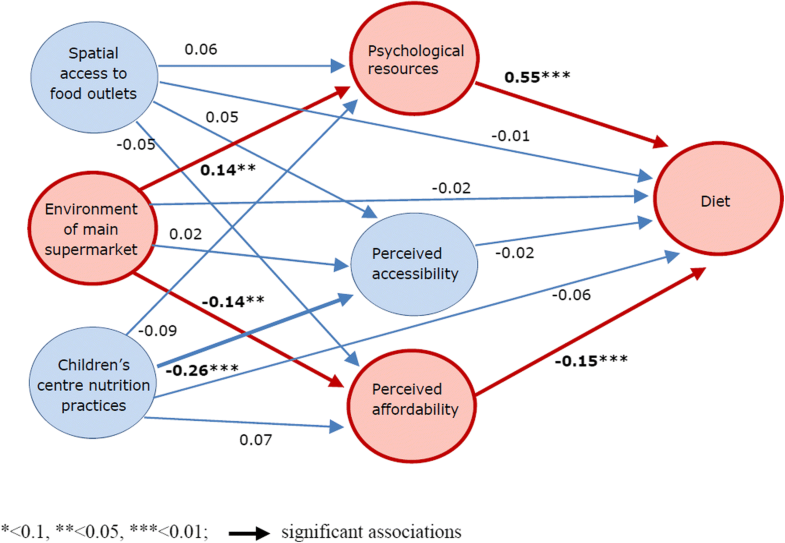 perceived control), ii) perceived food affordability, and iii) perceived food accessibility; these factors assume high levels of individual agency. The model also hypothesises that dietary behaviours are directly affected by three food environment factors that require lower levels of agency: i) spatial access to food outlets, ii) in-store environment of main supermarket, and iii) nutrition environment of children’s centres frequently visited. Finally, the model proposes synergistic action where the three food environment factors act indirectly on dietary behaviours, through the psychological factors. These direct and indirect relationships were examined using structural equation modelling (SEM). This technique has a number of advantages over other multivariate techniques including simultaneous assessment of multiple interrelated relationships to enable direct comparison, and improved estimation of relationships by using latent constructs to reduce measurement error . This study was cross-sectional and used participant data from the Southampton Initiative for Health (SIH), a study of women attending Sure Start Children’s Centres in Hampshire, UK [21, 22]. Sure Start Children’s Centres were a UK government initiative introduced to provide health, education and support services for families with young children aged under 5 years . These centres emphasised support for vulnerable families and offered play groups, parenting courses, child health checks and housing or employment services. Healthy eating was a priority issue for Sure Start Children’s Centres with nutrition information, snacks and cooking sessions frequently offered to parents and children using these services . The environmental data originated from observational surveys of food outlets and a cross-sectional telephone survey with children’s centre staff. The study area covered the three council areas of the SIH (Southampton, Gosport and Havant) plus Eastleigh, Fareham and Portsmouth because participants reported food shopping and working in these neighbouring areas. Southampton, Portsmouth and Havant have concentrated areas of high deprivation and are ranked in the most deprived third of the 326 local authorities in England; Gosport, Eastleigh and Fareham are more affluent . More than 98% of the study area was classified as urban. All study procedures, including acquiring written consent from all participants, were conducted according to the Declaration of Helsinki and were approved by the University of Southampton, Faculty of Medicine Ethics Committee (SOMSEC025.09, SOMSEC033.09, SOMSEC037.09, SOMSEC065.10). Participants were women who were pregnant or had a young child and whose home residence and main supermarket were located within the study area. All women were recruited while attending children’s centres located in Southampton, Gosport and Havant. Local Sure Start data indicated that 70% of children aged under 5 years were registered with one of their children’s centres at the time of the study . Detailed information about the 30% not registered was not available, however, children’s centre staff believed that the most advantaged and most disadvantaged families were least likely to engage with their services. A total of 509 participants who had previously completed the phase I SIH survey in 2009 undertook phase II by telephone between December 2010 and May 2011. During the same time period, an additional 412 were recruited in phase II to enhance sample numbers and completed the questionnaire face-to-face. Analysis of differences between the two groups of participants showed that mothers completing only phase II were younger (p < 0.001), more likely to have one child (p < 0.001), had lower levels of educational attainment (p = 0.04) and lived in more deprived neighbourhoods (p = 0.02) than mothers who completed both Phase I and II surveys. The phase II recruitment bolstered the numbers of disadvantaged mothers and by combining both groups the sample in this study had representation from across the socioeconomic spectrum. All participant information was treated as cross-sectional. Questions were asked about women’s age, number of children, highest educational qualification attained, home postcode, and postcodes of frequently visited locations (main supermarket, workplace, children’s centre, general practitioner and physical activity site). Home postcode was used to determine participants’ level of neighbourhood deprivation according to quintiles of the 2007 English Index of Deprivation income domain . The questionnaire also included items relating to dietary behaviours, psychological resources and perceptions of the local food environment which are described below. Table 1 summarises the four measures used to describe the dietary outcome latent construct: dietary quality score, fruit intake, fast-food intake and takeaway food intake. A dietary quality score was calculated for each participant using a 20-item food frequency questionnaire (FFQ) The score has been validated against serum folate, a biomarker of nutritional status . Participants were asked how often in the previous month they consumed each of the 20 foods. Dietary quality scores were calculated by multiplying consumption frequency for each item by corresponding coefficients identified from a principal components analysis and summing the results. Scores were standardised to have a mean of zero and standard deviation (SD) of one. Higher scores represented better dietary quality aligned with the national Department of Health and Social Care’s dietary recommendations in England (The Eatwell Guide) , characterised by higher intakes of vegetables and wholegrain bread, and lower intakes of processed meats, crisps and granulated sugar added to cereals, tea or coffee. Fruit intake was assessed separately by a question that asked how often in the previous month fresh fruit was consumed . Fast food and takeaway intake were assessed by asking how often in the past month foods from i) fast food chains and ii) independent takeaway outlets were consumed [30, 31]. Examples of fast food chains and takeaway outlets were provided to facilitate appropriate responses. Exploratory factor analysis showed these four measured variables loaded onto a single dietary latent construct using qualitative assessment and quantitative criteria of eigenvalue greater than one  and factor loadings greater than 0.32 . The total variance explained by the dietary latent construct was 23%. Total space covered by set of Euclidean 1000m (0.6 mile) buffers around postcode centroid of home and other frequently visited locations including main supermarket, work, GP, Sure Start children’s centre and physical activity location. Table 1 summarises the measures used to describe the three latent constructs that represent individual agency (psychological resources, perceived food affordability, perceived food accessibility). These constructs were identified from exploratory factor analysis of measured variables previously theorised and shown to predict dietary behaviours [12, 18, 19, 34]. The total variance explained by the three psychological constructs was 45%. Two measured variables, i) social support for fruit and vegetable purchasing and ii) perceived accessibility of healthy takeaway options in residential neighbourhood, returned very low factor loadings indicating that these variables represent different underlying processes to the other measured variables; they were therefore omitted. The psychological resources latent construct was characterised by four measured variables: i) perceived control over life, ii) self-efficacy for healthy eating, iii) healthy eating outcome expectancies, and iv) food involvement. These variables were measured using published scales with good reliability (Table 1) [35–38]. The perceived food affordability latent construct was characterised by two measured variables to assess participants’ food circumstances in the past year. Participants were asked whether they could afford to buy i) enough food and ii) balanced meals . The perceived food accessibility latent construct was characterised by three measured variables that assessed participant’s perceptions of i) food accessibility, ii) the variety of fresh fruit and vegetables and iii) the quality of fresh produce within a 10–15 min walk or 5 minute drive from their home . These perceived food environment measures were adapted from those used in previous research (Table 1). Table 1 summarises the measures used to describe the three environmental latent constructs. Exploratory factor analysis was used to determine the measured variables that characterised the spatial access to food outlets latent construct. Four measures of spatial access were included: i) square kilometre of individual activity space ii) variety of supermarkets in activity space, iii) food environment score for healthy outlets in activity space, and iv) food environment score for unhealthy outlets in activity space. The total variance explained by the spatial access to food outlet latent construct was 55%. The methods used to collect the spatial access data and create the individualised activity spaces and food environment scores have been described elsewhere . In brief, individualised activity spaces were produced by creating 1000 m (0.6 mile) buffers around postcode centroids of home and frequently visited locations using ArcGIS . Buffers that overlapped were merged into one space and the total area was calculated (km2). Cross-sectional food outlet data were collected during observational ‘ground-truthing’ of the study area between July 2010 and June 2011. A total of 1787 outlets were geocoded to postcode centroid using Geoconvert and ArcGIS (< 3% of locations did not match and Google maps was used to identify a proximal address). Coordinates for 20 types of retail and takeaway food outlets were overlaid onto activity spaces to determine the variety of supermarkets, and derive a healthy and an unhealthy food environment score for each participant (Table 1). The food environment scores (FES) represented spatial access to healthy and unhealthy food outlets respectively, and included weightings to characterise the healthfulness of the in-store environments based on the availability of healthy or unhealthy foods in each outlet type . The environment of main supermarket latent construct was described by a composite score representing the healthfulness of the in-store environment of each participant’s main supermarket (where they did most of their food shopping) using published methods . In brief, information about nine in-store factors (variety, price, quality, promotion, shelf placement, store placement, nutrition information, healthier alternatives, and single fruit sale) on 12 foods known to discriminate between better and poorer dietary quality were collected via in-store surveys. Data were collected between July 2010 to June 2011, to correspond with timing of participant interviews, from all supermarkets and convenience stores located in the study area. These data were used to create a standardized healthfulness z-score for each supermarket where women shopped (Table 1). The single composite score was used because conceptually all nine components are considered important indicators of the in-store environment. Exploratory factor analysis revealed that four measured variables characterised the children’s centre nutrition practices latent construct: i) food policy content, ii) healthy eating ethos, iii) availability of healthy eating information, and iv) barriers to promoting healthy eating. The total variance explained by the children’s centre nutrition practices latent construct was 46%. Data were collected via cross-sectional telephone survey, from August to October 2011, with a convenience sample of 86 staff members at 28 children’s centres located in the study area. Responses from staff members of the same centre (n = 2–5) were averaged to provide a single response from each centre for each item. The measured children’s centre nutrition practices variables were assessed using items adapted from published scales that assessed the nutrition environment of childcare centres and kindergartens (Table 1) [45, 46]. The distribution of all measured variables was screened prior to modelling. Two variables, the healthy and unhealthy food environment scores, were positively skewed and subsequently log transformed. To set a common scale for the analyses, all variables were standardised to have a mean of zero and standard deviation of one. Stata statistical software package version 13.0  was used to transform variables, conduct sensitivity analyses (t-test for continuous variables and Chi Squared test for categorical variables) and to summarize participants’ socio-demographic, behavioural, psychological and environmental variables. IBM SPSS Statistics 22.0  was used for exploratory factor analysis and IBM SPSS AMOS 22.0  for model testing. Testing a model in SEM involves two key stages: i) measurement model – confirms measured variables are significantly and adequately related to the model’s constructs; and ii) structural model – tests validity of relationships between constructs in the model . Confirmatory factor analysis was applied to validate three measurement models incorporating: i) dietary behaviours, psychological, perceived affordability and perceived accessibility latent constructs, ii) spatial access to food outlets construct, and iii) children’s centre nutrition practices construct. For the structural model, given that the three environmental constructs are likely to be related, covariance between these three constructs was set. The environment of main supermarket construct was defined by a single measured variable. It is recommended in these cases that the error variance be set to the variance multiplied by [s.d.2 * (1-α)] , where α is the Cronbach’s alpha statistic. The measurement and structural models were assessed for fit using five fit indices: Goodness-of-Fit Index (GFI ≥0.90 indicates good fit), Adjusted Goodness-of-Fit Index (AGFI ≥0.90 indicates good fit), Comparative Fit Index (CFI ≥0.90 indicates good fit), Root Mean Square Error of Approximation (RMSEA < 0.08 indicates good fit), and standardised Root Mean Square Residual (sRMR < 0.08 indicates good fit) [20, 51]. Bootstrap procedure is recommended for testing the significance of indirect effects . It was run with 2000 samples to produce pathway coefficients and 95% bias-corrected confidence intervals for the overall indirect associations of each environmental construct on diet through the three psychological constructs because AMOS is unable to examine the indirect effects of specific pathways containing latent constructs. In the adjusted model, confounding variables (age, number of children, educational attainment and quintile of neighbourhood deprivation) were added by creating direct associations from each covariate to the dietary behaviour latent construct and the psychological constructs. Of the 921 women who completed the phase II SIH survey, 82% (n = 753) had complete data and were included in this study. Participants excluded (n = 168), due to incomplete data, had higher educational attainment (p < 0.001) than those included but showed no difference in age, number of children or level of neighbourhood deprivation (p > 0.2). Table 2 presents the socio-demographic characteristics and dietary behaviours of the 753 participants with complete data. The mean age of the sample was 32 years (SD 6) and the vast majority had one or two children (80%). The age of children ranged from new born to 17 years but over three quarters (77%) were aged 5 years or younger. More than one third of participants (37%) had not attained an educational qualification after the age of 16 years and nearly a quarter (22%) lived in neighbourhoods within the most deprived quintile in England. Almost two thirds (60%) reported not being in paid employment. The mean dietary quality score for the sample was zero (SD 1), and the scores ranged from − 2.8 to 2.9. One standard deviation improvement in dietary score is equivalent to eating salad vegetables up to six times more often, and crisps up to six times less often a week. More than two thirds of women (70%) reported eating fruit once a day or more, while 38% and 21% reported never eating fast food or takeaway in the past month respectively. Table 3 presents the descriptive findings for each of the psychological and environmental measured variables grouped by construct. The average for all psychological resources variables was towards the upper limit of the scales indicating women generally felt a good sense of control over life, confidence in eating healthily and health benefits resulted from eating healthily, and were involved in food-related activities. Not having enough money to buy food or balanced meals was a problem for less than a fifth of women (17% and 13% respectively). Most women agreed or strongly agreed that they could complete their food shopping (75%), had a good variety of fruit and vegetables (67%), and had good quality fresh produce (79%) in their local neighbourhood. The spatial access to food outlet measures showed that the median geographical area of women’s individualised activity spaces was 10 km2 (IQR 8, 12) and that most women had access to three different types of supermarkets within this area. The median food environment score for healthy outlets was 98SD (IQR 69, 136) and the median food environment score for unhealthy outlets was -175SD (IQR -122, − 615), indicating that most women had greater exposure to unhealthy than healthy food outlets while undertaking their daily activities. The median healthfulness score for the 51 supermarkets where participant’s purchased most of their groceries was 1.8SD (IQR 1.7, 1.9), with scores ranging from − 0.7 to 2.2. One-SD difference in healthfulness score is equivalent to a more healthful store having 11 more varieties of healthy foods, double the number of healthier alternatives of less healthy food products, and a cheaper mean price (£/portion) of the healthy than the less healthy foods (up to 31 pence). The children’s centre nutrition practice measures showed a high median food policy score (40SD; IQR 33, 41), healthy eating ethos score (40SD; IQR 37, 41) and healthy eating information score (9SD; IQR 8, 10), indicating that promoting healthy eating was a priority in most centres; though staff reported a moderate number of barriers to promoting healthy eating (4SD; IQR 3, 4). Model fit was good for the dietary measurement model (GFI = 1.00, AGFI = 0.97, CFI = 0.97, RMSEA = 0.06 [0.02, 0.11], sRMR = 0.02) and for the measurement model incorporating the three psychological constructs (GFI = 0.98, AGFI = 0.96, CFI = 0.96, RMSEA = 0.05 [0.04, 0.07], sRMR = 0.04). The spatial access to food outlets measurement model showed adequate fit (GFI = 0.99, AGFI = 0.96, CFI = 0.99, RMSEA = 0.09 [0.05, 0.13], sRMR = 0.01). The children’s centre nutrition practices nutrition model revealed good fit for all indices (GFI = 0.98, AGFI = 0.92, CFI = 0.97, sRMR = 0.04), except RMSEA (0.12 [0.08, 0.17]). Post hoc modifications showed that placing a co-variance between the error terms for the healthy eating ethos and food policy variables improved model fit (GFI = 1.00, AGFI = 0.98, CFI = 1.00, RMSEA = 0.06 [0.00, 0.13], sRMR = 0.01). This action is justified by evidence showing that organisational policies influence organisational ethos, particularly the behaviours and attitudes of management and staff . Overall model fit for the structural model was good (GFI = 0.93, AGFI = 0.91, CFI = 0.91, RMSEA = 0.05 [0.05, 0.06], sRMR = 0.05). Figure 1 shows that the indicator variables generally loaded well on the latent constructs with most (72%) having factor loadings greater than 0.50 and only one a poor factor loading (< 0.32). All measured variables showed significant associations with their corresponding construct (p < 0.01) and the total variance in diet explained by the psychological and environmental constructs was 37%. Figure 2 shows the standardised regression weights of associations between constructs for the structural model. None of the environmental constructs were directly associated with diet (all p > 0.3). Spatial access to food outlets was not associated with any of the psychological constructs (all p > 0.2) and children’s centre nutrition practices was only associated with one psychological construct (β = − 0.26SD, p < 0.001; others p > 0.1): better centre nutrition practices were associated with poorer perceptions of local healthy food access. Perceived access to healthy food however was not associated with the diet construct (p = 0.7). The environment of women’s main supermarket was positively associated with the psychological resources construct (β = 0.14SD, p = 0.03) and negatively associated with the perceived food affordability construct (β = − 0.14SD, p = 0.01), whereby women who shopped at supermarkets with healthier environments (i.e. better availability, pricing and placement of healthy foods) had more psychological resources attuned to healthy eating and fewer concerns about affording food or balanced meals. The psychological resources and perceived food affordability constructs were both significantly associated with the diet construct: women with more psychological resources attuned to healthy eating had better diets (β = 0.55SD, p < 0.001), while those with greater food affordability concerns had poorer diets (β = − 0.15SD, p = 0.01). The indirect association between supermarket environment and diet through the three psychological constructs was significant (β = 0.07, 95%CI 0.004, 0.071). Indirect associations with diet through the three psychological constructs were not significant for spatial access to food outlets or children’s centre nutrition environment (β = 0.03, 95%CI -0.01, 0.07 and β = − 0.04, 95%CI -0.08, 0.01 respectively). Adjustment for covariates known to predict diet (age, number of children, educational attainment, neighbourhood deprivation) weakened the model goodness of fit indices slightly (GFI = 0.92, AGFI = 0.89, CFI = 0.89) however, the badness of fit indices remained within recognised limits (RMSEA = 0.06 [0.05, 0.06], sRMR = 0.06). There was little alteration in the strength or significance of the associations between constructs after adjustment; only the relationship between perceived food affordability and diet attenuated (p = 0.2). Each of the four potentially confounding variables were significantly associated with the diet construct (all p < 0.05). The indirect association between main supermarket environment and diet, through the three psychological constructs, remained significant after adjustment (β = 0.03, 95%CI 0.004, 0.07). This study is one of very few to examine the pathways between dietary behaviour and multiple food environment and psychological factors. The overall model predicted dietary behaviours well. The results support the hypothesis that low-agency environmental determinants and high-agency individual determinants are synergistically associated with dietary behaviours: the in-store environments of women’s primary supermarkets were indirectly associated with their dietary behaviours, acting via their individual-level resources. More specifically, shopping at less healthful supermarkets (where availability, pricing and promotion favoured unhealthy foods) was associated with women having fewer psychological resources for healthy eating and poorer dietary behaviours. Use of less healthful supermarkets was also associated with greater food affordability concerns and poorer dietary behaviours (though the latter weakened after adjustment for confounding variables). Our results showed that the association between psychological resources and dietary behaviour had the largest effect size of all associations in the model. However, the strength of relationships between the supermarket environment and psychological resources and food affordability resources were not insubstantial, particularly if population reach is considered . No direct associations between women’s dietary behaviours and the three environmental factors or women’s perceived access to healthy food access were observed. This pathway analysis pinpoints three focal points for intervention to improve population diet: i) the in-store environment of supermarkets, ii) an individual’s psychological resources for healthy eating and iii) an individual’s perceived affordability of healthy food. Moreover, our findings suggests that interventions are most likely to be effective if strategies targeting these focal points are implemented concurrently. Supermarkets are an important source of food for many people [55–57] and therefore offer an important setting for public health intervention to improve population diet. A systematic review of nutrition intervention studies in supermarkets and grocery stores revealed good evidence that low-agency price reduction interventions increase purchases and/or intake of healthy foods, and some evidence for high-agency nutrition information strategies (e.g. shelf or product labels, posters and flyers) improving dietary behaviours . Assessment of study quality however identified that most of the research was poor, having medium to high risk of bias. Three high quality randomised control trials from New Zealand , Australia  and the Netherlands  assessed the independent effects of: i) nutrition/behaviour change materials, ii) price reduction (12.5, 20 and 50% respectively) on fruit and vegetables, iii) price reduction plus nutrition/behaviour change materials or iv) no intervention, on supermarket purchases of targeted foods. The mechanisms underlying these interventions were that increased psychological resources (i.e. nutrition knowledge, self-efficacy) in addition to price reductions on healthy foods would together improve the healthiness of food purchases. These three studies showed that nutrition/behaviour change materials alone had no effect on fruit and vegetable purchases while price reduction alone and price reduction plus nutrition/behaviour change materials increased fruit and vegetable purchases; though the latter had little additive effect over price reduction alone. At first glance, these effectiveness trials appear inconsistent with our modelling results. However, the nature of the price reduction strategies meant that participants were not blinded to the intervention and were fully aware of the reduced cost of fruit and vegetables. It is therefore highly probable that participants’ perceptions of the affordability of healthy foods (i.e. fruit and vegetables) improved, particularly among low-income groups; whether this mediated the increase in purchasing was not tested in these studies. The process evaluation results from the Australian trial supports the notion that price reduction improved perceptions of fruit and vegetable affordability . More than two thirds of the participants who used the price discounts reported doing so because they saved money. Additionally, many perceived that the discount enabled them to buy more fruit and vegetables, or a greater variety of fruit and vegetables, particularly the more expensive types. Furthermore, participants reported that the discount made them feel appreciated and rewarded for making healthy choices; suggesting that low-agency environmental strategies may also enhance an individual’s psychological resources. This process evaluation, and our study results, suggest that strategies to improve the supermarket environment could help to improve an individual’s psychological resources. Something as obvious as product price reduction may facilitate improvements in self-efficacy and sense of control when buying healthy food products because individuals face fewer financial or physical barriers to healthy eating. Such mechanistic pathways are yet to be tested in intervention research but would be particularly relevant among low socioeconomic populations who hold fewer psychological resources than those more advantaged [63, 64]. Our findings suggest that high-agency interventions targeting individual psychological resources when combined with low-agency supermarket environment interventions may confer greater benefits on dietary behaviours than either intervention alone. The three supermarket trials described above found no such additive effect. One possible explanation is poor engagement with the nutrition/ behaviour change materials [61, 62]. Our measure of psychological resources excluded nutrition knowledge because there is growing consensus that just giving people information about what they need to do to change their health behaviour is ineffective . By illustration, the Australian trial’s process evaluation revealed that participants could recall the healthy eating messages they received and reported liking the recipe ideas but used them infrequently . An alternative to traditional educational approaches is to treat people, not as lacking knowledge, but as experts of their lives and their behaviours, helping them to break down their behaviours at the time and places where they occur and supporting them to act differently [2, 22]. Such an approach, when combined with low-agency environmental strategies, may help individuals to break the automatic patterns of purchasing unhealthy foods in some environments and create consistently healthy dietary practices. New technologies offer great potential to prompt people to reflect at times and places where they are undertaking dietary behaviours such as food shopping and cooking. The lack of association we found between women’s dietary behaviours and their spatial access to food outlets or perceived access to healthy foods is consistent with findings from a systematic review of observational food environment research . A systematic review of intervention studies measuring the effect of a new supermarket opening on the diets of nearby residents also found little evidence that enhanced access to supermarkets improved dietary behaviours . However, in contrast to our results, the review showed that perceived access to healthy foods improved consistently across studies and the authors recommended longer follow-up periods to ascertain possible delayed dietary effects. Another of our findings showed that better children’s centre nutrition environments were associated with poorer perceptions of healthy food access. We reason that children’s centres with good nutrition policies and healthy eating activities may heighten women’s awareness of the importance of eating healthily and of the high numbers of unhealthy food outlets in their neighbourhoods. The children’s centres in this study were predominantly located in more deprived neighbourhoods which have a high prevalence of fast food outlets . Our work provides evidence to support continuation of nutrition-related activities in children’s centres. In this study we used a novel application of SEM to determine the relative strength of associations in a multi-component model to pinpoint areas for future intervention to improve population diet. The model was derived from previous theoretical and empirical work. By using latent constructs, SEM enables relationships to be measured free of error because the error for each construct is estimated and removed, leaving only common variance to calculate more accurate relationship estimates . Additionally, SEM enables simultaneous assessment of direct and indirect associations between multiple constructs allowing relative comparison of the strength of relationships in addition to providing measures of statistical significance . The use of actual exposures, including main supermarket and activity spaces, and the temporal connection between the collection of food environment, individual and dietary data increases confidence in the study findings. Finally, our sample had good representation of individuals from disadvantaged backgrounds. The findings of this study are limited by the use of cross-sectional data which precludes conclusions relating to cause and effect. The setting within Hampshire, UK, somewhat limits the generalisability of the findings to other populations. Our study showed good model fit, however, this does not necessarily conclude that all necessary constructs have been included in the model . For example, the home nutrition environment and social support for healthy eating have been shown to play a significant role in path analyses of previous obesity-related pathway models [50, 66]. We did not account for potential self-selection bias in our analyses . It is therefore not clear the extent to which women in our study chose to conduct their daily activities in the areas they did because of the food outlets available to them, and how this may have affected our results. We applied a model that was linear in direction which may have under-represented the interplay or antagonistic actions between constructs. Testing the model’s pathways in intervention studies among different populations could help validate and/or improve the model and enhance its generalizability. Our findings provide empirical evidence for individual dietary behaviours being linked to both the environments of the supermarkets where women shop and their psychological resources. Policy initiatives in supermarkets that are likely to be effective at improving population diet, including the provision of greater varieties and cheaper pricing of healthy foods whilst simultaneously reducing promotions of unhealthy foods. When coupled with interventions to enhance psychological resources, such as nutrition self-efficacy and perceptions of healthy food affordability, these strategies are likely to be maximally effective. Individual strategies that hold great potential, particularly among those with the poorest diets, are those that steer away from simply providing nutrition information and towards encouraging people to recognise environmental manipulations and to feel good about having made healthy food choices. Researchers have a vital role in working with retailers to scientifically evaluate, using factorial methodologies, the pathways identified in this study and any differential effects by socioeconomic status. We are grateful to the mothers and children, Sure Start children’s centre staff and store managers who participated in the Southampton Initiative for Health. We thank the broader Southampton Initiative for Health team for their contributions to the study. We offer particularly thanks to Jamie Lawrence for her assistance with the food environment data collection and to Patsy Coakley for computing support. This research and the authors of this paper are supported by the following funding sources: United Kingdom NIHR fellowship, United Kingdom Medical Research Council and NIHR Southampton Biomedical Research Centre, University of Southampton. Kylie Ball is supported by a Principal Research Fellowship from the Australian National Health and Medical Research Council (NHMRC). The views expressed in this publication are those of the author(s) and not necessarily those of the NHS, the NIHR, the UK Department of Health and Social Care or NHMRC. The dataset can be made available upon request, subject to appropriate approvals. Researchers wishing to use the data can make a formal application to the Southampton Initiative for Health Oversight Group by emailing mrcleu@mrc.soton.ac.uk. Subject to approval that the intended purpose is compatible with the study’s ethical approval, and formal agreements regarding confidentiality and secure data storage being signed, the data would then be provided. CV and JB conceived of the study, designed the food environment audit tools, coordinated the data collection, and wrote the first draft of the manuscript. CV, GA and GN performed the data preparation and statistical analyses. KB, GM, MEB and CC participated in the design of the study and provided methodological advice. All authors contributed to the draft manuscript and approved the final manuscript. All study procedures, including acquiring written consent from all participants, were conducted according to the Declaration of Helsinki and were approved by the University of Southampton, Faculty of Medicine Ethics Committee (SOMSEC025.09, SOMSEC033.09, SOMSEC037.09, SOMSEC065.10). CV, GN, GA, GM and KB have no conflicts of interests to declare and no further financial disclosures to make. JB and MB have received grant research support from Danone Nutricia Early Life Nutrition. CC has received consultancy, lecture fees and honoraria from AMGEN, GSK, Alliance for Better Bone Health, MSD, Eli Lilly, Pfizer, Novartis, Servier, Medtronic and Roche. The study described in this manuscript is not related to any of these relationships. UK Department of Health and Social Care. The Eatwell Guide. HM Government. 2016; [https://www.nhs.uk/live-well/eat-well/the-eatwell-guide/]. Accessed 18 Nov 2018.